A product code for the new AMD custom silicon bound for Sony’s PlayStation 5 has been leaked online. The 2G16002CE8JA2_32/10/10_13E9 code itself might look like someone has passed out face down on their keyboard, but it’s far from gibberish. There’s actually a surprising amount of information that can be gleaned from the jumbled mess of characters. The key specs that have come out of the decoding of the alphanumeric string show a CPU component with eight physical cores, a 3.2GHz boost clock for the chip, and a PCI-ID that shows a Navi 10Lite GPU. That seems to be a shorthand term for the GPU by all accounts, with the real codename for the custom graphics silicon noted as Ariel. There is seemingly also confirmation that the SoC will use AMD’s Zen architecture, but not specifically which generation of the processor design Sony will end up with. Right now it could be either Zen+ or Zen 2. The speculation, however, is the numeral relating to the cache of the chip would seem to peg it as a Zen+ core rather than a shiny new Zen 2 chiplet. That’s not wholly surprising given that the Zen 2 processor architecture isn’t even out on the PC yet, with the 3rd Gen Ryzen chips set to launch in the middle of the year. Public unavailability of the Zen 2 design isn’t necessarily a guarantee that AMD wouldn’t use it for a custom SoC, but reports are that Sony has been working on this design since before the engineering samples of Zen 2 were doing the rounds for evaluation. Still, even if the PlayStation 5 is rocking Zen+ CPU core that is still far more advanced than the weakheart Jaguar cores creaking away inside of the PS4 Pro. And while the codename does give an indication of the number of physical cores inside the new SoC it doesn’t say whether simultaneous multithreading (SM) is being enabled on this version of the Zen+ processor design. If the PlayStation 5 is using an SM-enabled Zen+ core at its heart you could be looking at a games console in 2020 which has 16 threads of processing power inside it. And with the touted 3.2GHz boost clock it’s going to be running mighty quickly too. The Jaguar cores in the PS4 Pro are currently running at just 2.13GHz, which is more than 1GHz slower than the potential top-speed of the PS5. There isn’t the same level of detail about the Navi 10Lite GPU the Zen+ chip is going to be paired with, however. The speculation is that the ‘10’ in front of the ‘13E9’ GPU ID could relate to the clockspeed of the chip, putting it at 1GHz. Compared with the Polaris-esque graphics silicon in the PS4 Pro, running at 911MHz, that would put the 7nm Navi GPU a fair bit quicker in frequency terms. 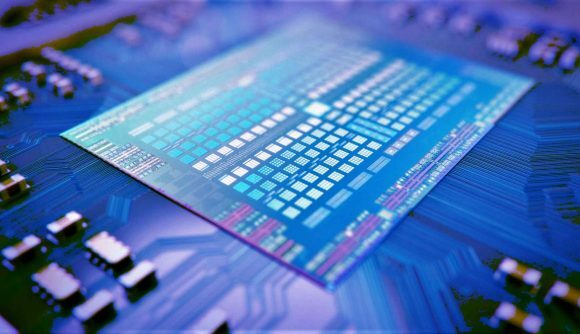 With TSMC confirming that its 7nm design can offer 25% extra performance at the same power, the PS5 operating with a higher clockspeed, and likely more Navi-enhanced GCN cores inside the new GPU, should go far beyond that rather conservative percentage performance increase. Isn’t it fun to see just what information can be gleaned from a mere string of 27 characters? Now, where’s the coded string for our Navi graphics cards, then?